Denny’s is a restaurant chain, serving tasty foods in over 1,600 locations all over the world, including the U.S., Canada, Japan, and the United Arab Emirates. It serves breakfast, lunch and dinner every day, even on holidays. It is a popular family restaurant that serves delectable meals to anyone of any age. Denny’s Diner is popular because of its burgers. You have a variety of choices available and you can even build your own burger depending on your preferred taste starting from choosing your bun, then cheese, patty, toppings, sidings and other add-ons. They have several breakfast meals to choose from, which includes All-American Slam (with eggs, cheese, bacon, sausage, hash brown, and bread), Belgian Waffle Slam (with a waffle, eggs, bacon, and sausage), Loaded Veggie Omelets (with egg omelet, spinach, mushroom, squash, tomatoes, and cheese), Moons Over my Hammy (ham and egg sandwich, cheese, and hash brown) and so much more. They also offer Breakfast Sides like bacon, seasonal fruits, oatmeal, and a lot more. The good news is, all these available at any time of the day! This restaurant always tries to innovate and features food that they think would be potential bestsellers. You can check their featured and new mouth-watering products online for more details. Kids will enjoy making their own grand slam food by simply choosing three items on the create-your-own kid’s menu list, which includes eggs, bacon, and egg. They also have chocolate chip pancakes, French toast with banana and chicken nuggets in fun shapes. Our seniors or those aging from 55 and above can also choose from the fully loaded yet hearty meals. They are specially prepared for our seniors that need more care about their nutrition. The most tempting meal for them is the Senior Grilled Chicken. It has a grilled chicken breast, salad, and soup. Even if you are on a strict diet, you can still enjoy Denny’s great tasting food. They have Fit Fare Menus that offer great choices of food loaded with vegetables and fruits. If you do not want to add meat to your diet, you can choose Tilapia Ranchero wherein you can have grilled fish fillet with avocado, potatoes, and broccoli. 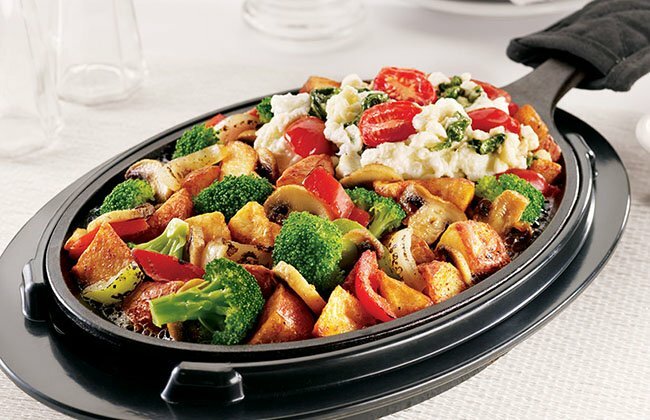 If you are a vegetarian, you will be interested to know that they have Veggie Skillet that offers different vegetables like potatoes, mushroom, broccoli, tomatoes, and a lot more in a single serving. With Fit Fare Menus, you can be sure that you are eating light and with lower calories. This promotion is good for people who do not have to splurge much on big serving food, but rather want to eat within their budgets. You cannot imagine that you can enjoy a great tasting Strawberry Pancake with Ice cream for only $2 and an All You can Eat Pancakes for only $4! For only $6, you can enjoy Turkey Sandwich with cheese and soup. Lastly, you will surely come back once you have tasted the Country-Fried Steak and Eggs Skillet (with gravy and potatoes) for only $8! 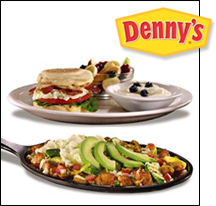 Denny’s is committed to making each customer happy with its big servings of deliciously prepared food. They also offer different promotions and discounts regularly so better check their website or ask their friendly service crew. However, promotions and prices, as well as the availability of certain menus may vary depending on locations, but you are still guaranteed of the freshness and quality of food they serve.